‘묘법연화경 권3~4, 5~7(妙法蓮華經卷三～四, 五～七)’은 조선 전기 왕실에서 주도하여 간행한 불경으로, 김수온(金守溫, 1410~1481년)의 발문에 간행 시기와 연유가 분명하게 남아 있고, 보존상태도 원래의 표지만 결락되었을 뿐 온전하다. 또한 장막동(張莫同), 최금동(崔今同), 고말종(高末終), 이영산(李永山) 등 일류 각수(刻手)들이 참여하여 판각이 정교하고, 정밀하게 인출하여 먹색이 진하고 고르다. 한 책(권5~7)의 서배(書背)에는 비단이 남아 있는 것으로 보아 본래 비단 표지의 포배장이었을 것으로 추정된다. 묘법연화경은 구마라집(姚秦, 344~413년)이 한역한 불교경전으로 ‘법화경’이라 약칭하기도 하는데, 초기 대승경전 중에서도 가장 중요한 불교경전이다. 천태종의 근본경전으로 한국에서는 일찍부터 불교전문강원의 과목으로 채택되었고 화엄경과 함께 한국 불교사상을 확립하는 데 가장 크게 영향을 미쳤다. 보문사 소장의 묘법연화경은 글자의 깨짐과 계선의 마멸상태로 보아 초인본은 아니고, 성종연간(1470~1494년)에 간행된 후인본으로 보인다. 동일한 판본으로는 보존상태가 온전하고, 인쇄상태와 지질도 뛰어나므로 자료로서의 가치는 높다고 판단된다. Volumes 3-7 of Saddharmapundarika Sutra (The Lotus Sutra) published during the early Joseon Period (1392-1910) under the commission of the royal family have been preserved in their original condition except the covers, which have fallen off; they contain the postscript written by Kim Su-on (1410-1481), informing readers as to when and how the scripture was published. 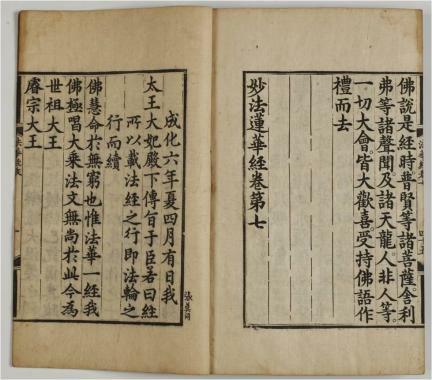 The books are printed neatly with uniform thickness of ink thanks to the use of woodblocks elaborately carved by top-class wood engravers of their time including Jang Mak-dong, Choe Geum-dong, Go Mal-jong, and Yi Yeong-san. On the spine of one book (Volumes 5-7) is a trace of silk fabric, suggesting that it was produced in wrapped-ridge binding format using silk cover. The Lotus Sutra has been one of the most important scriptures for Mahayana Buddhism since it was translated into Chinese by Kumarajiva (344-413). 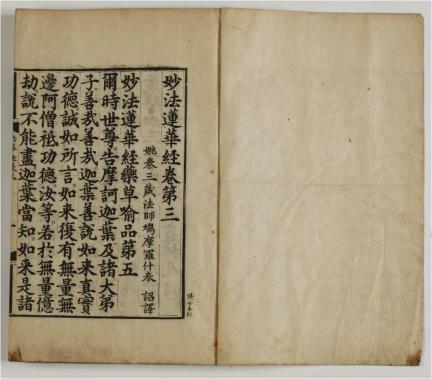 One of the foundational texts of Cheontae Order of Korean Buddhism, the scripture rapidly established itself as a key textbook in many Buddhist academies across Korea; it has grown into one of the two most important scriptures -- the other being the Avatamsaka Sutra (The Flower Garland Sutra) -- in the history of Korean Buddhism. 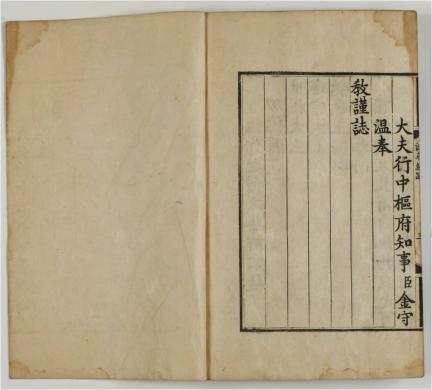 The defaced characters and ruled lines in the texts collected in Bomunsa Temple reveal that it is not the original but one of the secondary editions published when the Joseon dynasty was under the rule of King Seongjong (1470-1494). 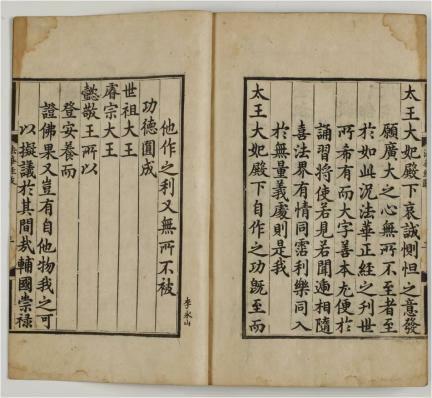 The printing condition, preserved better than other texts of the same edition, and the use of fine-quality paper make it a valuable historical and cultural heritage item.